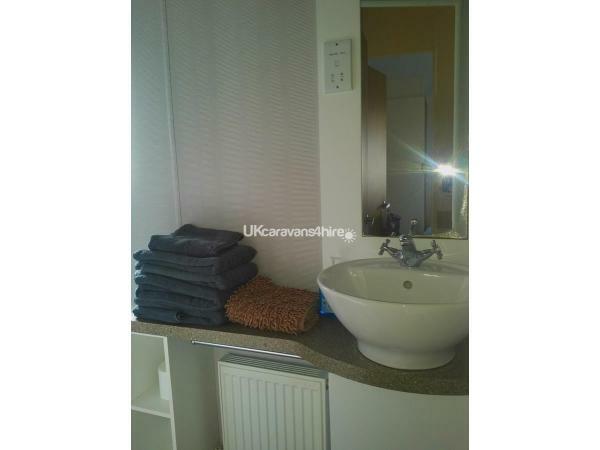 •	No smoking inside – UK legislation provides that smoking is not permitted in serviced accommodation. •	No swimming in the lake, no matter how tempting it may be! •	Switch the heating off when you are out, or set the timer (just like a normal boiler timer), if you leave the heating on when out you will come back to a boiling hot house! •	Please be respectful of neighbours. No Nuisance level music. That doesn’t mean you can’t play music and have a BBQ or play party games etc, but does mean applying common sense. Please do not play loud music after 10pm or before 11am. If security have any need to step in then this will be reported to the owner. Repeat offenders will be asked to leave and no refunds will be given. •	You are welcome to set up swing ball etc on the grass or have a BBQ (but please don’t burn the grass or place disposable BBQ’s directly on the grass). The left hand side of the accommodation is for your exclusive use ( ie the side the main door is on) – the right hand side belongs to neighbours. •	Falsified Bookings – Any booking obtained under false pretence will be subject to forfeiture of advance payment, deposit and/or rental money, and the party will not be permitted to check in. •	Pets are allowed with owner permission. Pet owners are responsible for cleaning up any/all pet refuse. Pets are not allowed on furniture at any time. Any evidence of pets on furniture will incur extra cleaning fees of up to £40. •	All pets must be up-to-date on vaccinations. Heartworm prevention is highly recommended. All pets are to be treated with Advantage or similar topical flea and tick repellent three (3) days prior to arrival. Fleas and ticks are very rampant and can cause harmful/fatal illness to humans and pets. All items above are the sole responsibility of the pet owner. We assume no responsibility for illness or injury that humans or pets may incur while on the premises, unless it results from an act or omission on our part. •	There is a key box at the accommodation, so you don’t need to queue at reception to get your key. The key code will be sent to you prior to arrival usually by text to your mobile. Simply enter the code and the box will open and provide you with TWO keys. Please leave one key in the box at all times – the park charge £50 for replacement keys and if you lose one key, at least you can still get in the accommodation with the key in the key box. •	There is a Brand New Gate House which is manned 24/7 with a friendly face as well being an electronic gating system. Guests need to show evidence of booking to the security guard in order to enter the park. Please ensure that you inspect the accommodation on check-in. Unless we receive notification otherwise within 24 hours of check-in we will be entitled to assume that you have fully accepted that the condition of the accommodation is in good repair, condition and in a clean and tidy state and you will waive any right to claim otherwise. Risk of damage to the accommodation and its contents will pass to you on check-in and remain with you until the accommodation is returned to us. You shall be liable for all loss or damage (except fair wear and tear) caused during the rental period, and for any reasonable loss of rental income resulting from such loss or damage. A refundable security deposit of £100 to cover your obligations under this Agreement will be taken prior to check-in. This may be in the form of a payment or an authorisation to deduct payment from your debit or credit card used to make the Booking. Any security deposit paid will be returned to you in full (or any payment authorisation cancelled) upon the accommodation being returned to us in accordance with the terms of this Agreement. Where you are liable for loss or damage, we may withhold some or all of your deposit to cover the same and our administration fees associated with repairing or dealing with the loss or damage. These will be Additional Charges. Where Additional Charges are payable, you hereby authorise us to take them from the credit or debit card used to make the Booking. All Additional Charges are due on the check-out date, unless otherwise agreed with the owner. If you fail to pay any Additional Charge within 14 days of the date of our invoice requiring payment of the same, you will incur an administration fee of £50 to cover the costs of sending you our debt collection letter, which will follow. The security bond will be refunded within 10 days of check out and key return and once checks have been satisfied. The damage bond will not be withheld for small breakages such as plates/cups etc. What it will be withheld for is for damage which requires repairs or replacement- eg damage to carpets/lino, damage to furniture such as sofa, loss of key etc. Basically if you spill red wine on the carpet and don’t clean it up then the carpet has to be steam cleaned or replaced. Fabric upholstery cleaner is provided, please use it if you have a spillage! Note also that the owner will do everything to minimise costs of replacement, i.e. a like for like basis. Very reluctantly we have had to institute a fair usage policy on the gas. One guest left the heating on full with all the windows open. A gas bottle should last circa 1-2 months in summer and two- three weeks in winter. A record of new bottles is kept by the park. Each bottle currently costs £60. The most common cause of excessive gas use is leaving the heating on upon departure (sometimes this is not discovered for days depending on when the cleaners are in) or leaving the heating on when out, or leaving it on all the time and opening the windows when they get too hot. If a guest uses excessive gas then a £25 charge will be levied from the damage/bond deposit. In the unlikely event we have to cancel or make a change to your accommodation we will use all reasonable efforts to contact you as soon as possible to explain what has happened and inform you of the cancellation or change. If possible, we will offer alternatives, but should these alternatives be unacceptable to you the booking will be treated as cancelled and we will refund any money you have paid to us within 10 days of any cancellation. We shall not be liable for changes, cancellations or any other effect on your booking due to events beyond our reasonable control (force majeure), including (by way of example only and without limiting the generality of the foregoing) terrorist activity, industrial disputes, natural or manmade disasters, fire, and adverse weather conditions. We shall have no liability to you for the death or personal injury to you or any members of your party unless this results from an act or omission on our part. Any guest using their own electrical appliances (hairdryers, curlers, tongs, shavers, personal computers, personal stereos etc.) must use the appropriate adaptor. Non-UK plugs used without the appropriate adaptor/transformer are a serious fire risk. Please ensure that all heated appliances are switched off and stored safely before leaving the accommodation. Guests found to be in breach of this rule may be asked to leave with immediate effect. You must take all necessary steps to safeguard your personal property and we accept no liability to you in respect of damage to, or loss of, such property unless caused by negligence on our part. Cars and their contents are parked at their owners’ risk. Please ensure that cars are locked and possessions are left out of sight. There is on site security present 24/7, but there remains a risk of theft particularly during busy periods. Guest property left in the apartment will be kept for 1 week after departure or forwarded at the guest’s expense. Save where there is a total failure to provide useful accommodation as reasonably expected under this agreement, we cannot be held responsible for any failure or interruption to services to the apartment, for example, gas, water and electricity, or for any damage, disturbance or noise caused as a result of maintenance work being carried out in any part of the park. We shall have no liability for any loss which was not foreseeable at the time we entered this Agreement or losses not caused by our breach of this Agreement, and, if you are entering this Agreement in the course of a business, we shall have no liability for any loss of profit, loss of or damage to goodwill, increased costs, loss of anticipated savings, loss of business, or any special, indirect or consequential loss (whether arising through breach of contract, tort including (without limitation) negligence, or breach of statutory duty. In any case our total liability to you is limited to the total cost of your reservation. All descriptions and photographs of the accommodation are for illustration only and we do not warrant that they are accurate or complete, although we do use all reasonable endeavours to ensure that they are. 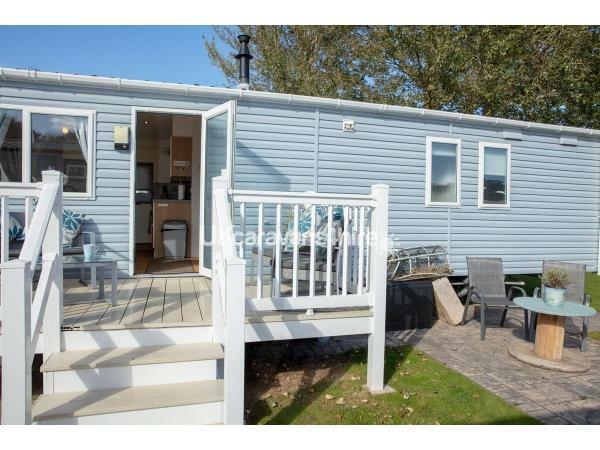 The 3 bedroom Willerby Avonmore called 'Betty' is a prestige caravan (with decking and separate patio) with an open plan living, dining and kitchen area. Betty sleeps 6 ( or can sleep 8 on request). Betty is second row back in Lakeside East. 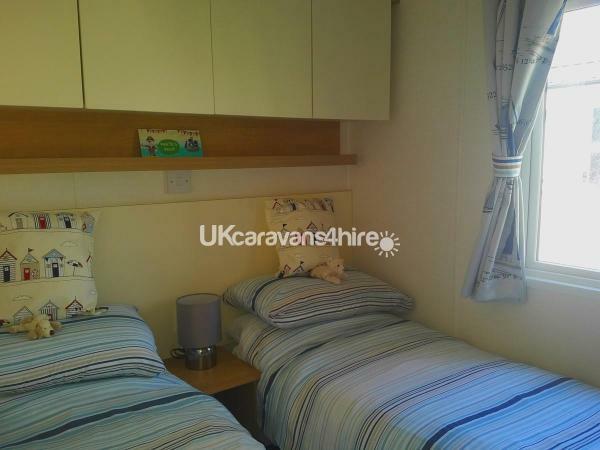 This caravan is roomy, at 38 x 12ft- most caravans are 35ft or 36ft. Betty has double glazing and central heating. The decking is great for BBQ’s or a place to read a book, sip wine and have a ‘Nana nap’! 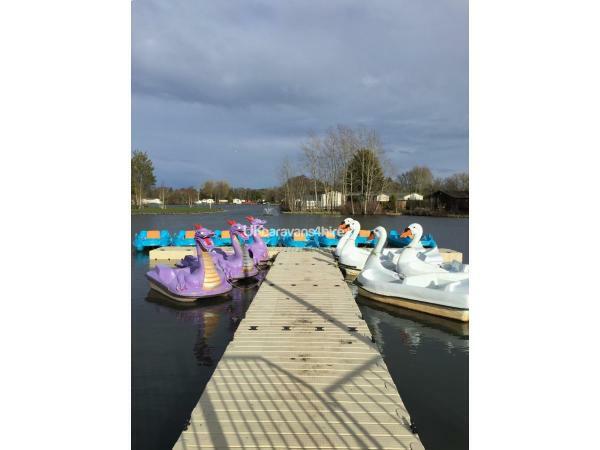 The Haggerston Complex is 5mins walk away along the side of the lake. In 2018 we have facebook reviews of 5/5 stars and 9.8/10 on booking dot com. The lounge has a freeview TV and DVD player and provides the perfect place to relax and unwind, with the soft hues of the oak style units and maritime themed furnishings. 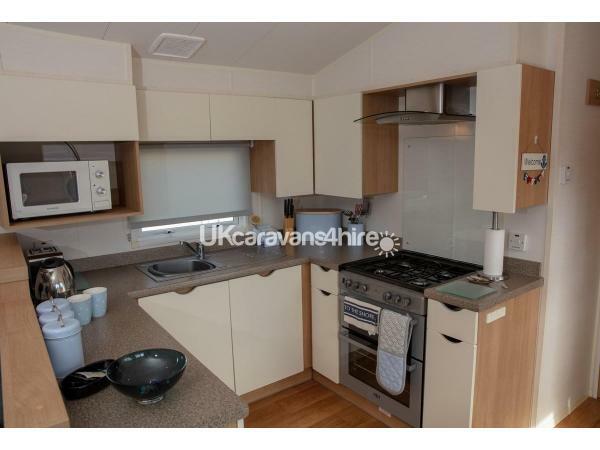 The kitchen has a modern feel with plenty of cupboards, built in fridge and three drawer freezer. 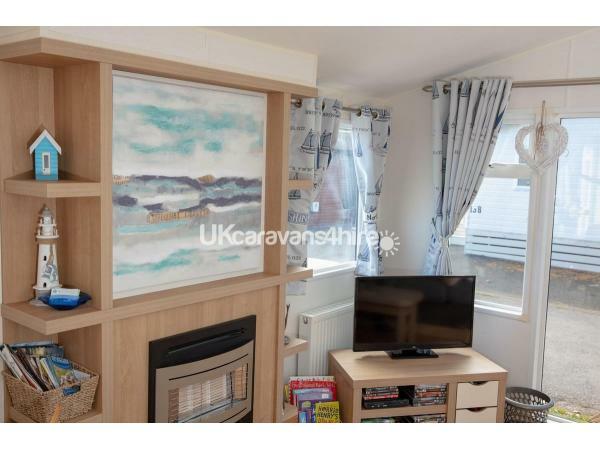 The master bedroom has a nice beach feel and features a double bed, big wardrobe and an ensuite toilet. 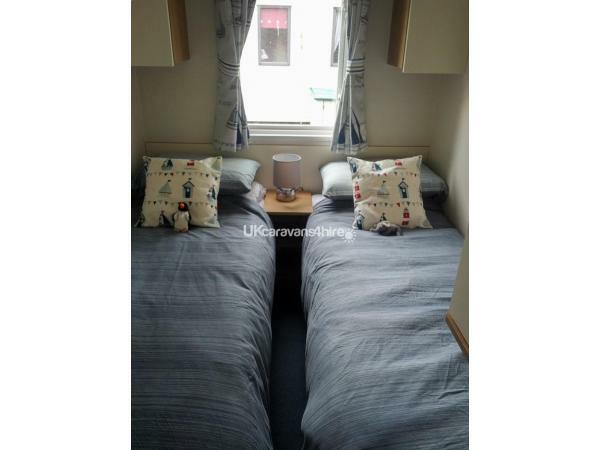 Both twin bedrooms have two single beds and ample storage. 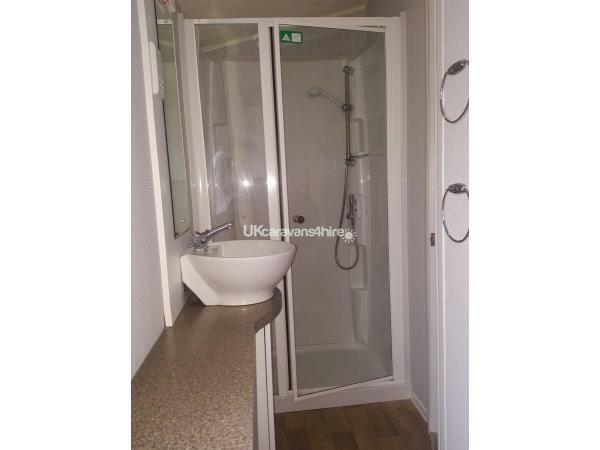 The main bathroom is a shower room with toilet and basin. The main bedroom also has another freeview TV. All you need for the stay is provided from bin bags, cling film, foil, cleaning stuffs, tea/coffee/sugar, to herbs and spices, flour, oil, vinegar, tea towels and oven gloves, 4 toilet rolls, 1 kitchen roll, handwash, small iron and ironing board, high chair, full information pack including emergency contacts, tourist info pack/maps/guides etc including owner guide to best local places to go to off the park. There is even an emergency toiletries and sanitary products supply in the main bathroom. There's a first aid kit, smoke alarms, carbon monoxide detector, the boiler, gas fire and electrics and inspected every year. Gas and electric are included. For kids/toddlers there is a dizzying array of kiddie cutlery and plastic crockery, high chair, baby bath, loads of kids DVDs, books, and some toys (be careful of small parts with younger ones). The twin bedrooms are pirate themed. 7 nights either Friday to Friday or Monday to Monday. To book there is a £100 deposit which secures the booking. Full balance is due four weeks prior to your arrival. Cancellations within 4 weeks of arrival are non refundable. There is also a £100 fully refundable damage deposit due 48hour prior to arrival and a £40 cleaning/bedding/towels fee. Park 'Fun passes' are not included in the price can be purchased at main reception. Please note that we don't use Haven cleaners, we use private cleaners who do a full inventory check inbetween bookings. Im a single mum and have poured my savings into this van - please treat it with care and respect. No reviews found. If you have recently stayed in this holiday home please leave a review, it only takes a few moments and will really help future guests when they are searching for holiday accommodation at Haggerston Castle.